Whether you are constructing a new home, or remodeling, leaded beveled glass is a great way to instantly increase the design appeal and value of your New Orleans or Mandeville home. There are so many different ways to create leaded beveled glass, in terms of texture, pattern, design, and translucency, that the possibilities are endless. While this style of glass treatment may have originated back in the Victorian era, it is still having a major and modern impact on the design of homes today. 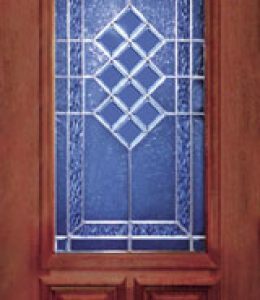 There are numerous design choices to be made when choosing the glass for your new door or sidelights for your entryway. The glass can be frosted, beveled, or can incorporate different colors. You can also choose to utilize classic shapes into your design, such as diamonds or teardrops, which will reflect the light in dazzling ways. 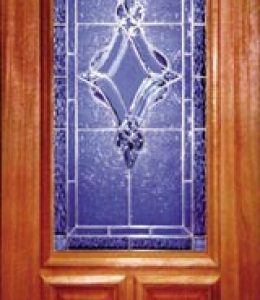 At Doors of Elegance, we have numerous glass patterns that you can choose from, and we would be happy to help you create a design that fits your unique plan. Having glass features in and around your doorway can brighten your entryway area, and can make your home feel more inviting in general. The light that is allowed in through the glass makes this area of the house feel more open and spacious. However, homeowners can sometimes feel uncomfortable and exposed having large windows on the door. Leaded beveled glass provides the perfect solutions. The glass sheets are constructed using clusters of smaller glass pieces cut at varying angles, and the glass can have different tones and colors as well. These elements turn the glass into a piece of art, and they also restrict people from being able to see through into the house. The homeowner receives all of the benefits of having light brighten the home, without worrying about privacy. Doors of Elegance offers many different types of unique glass options to our clients, including lead, brass, zinc, and patina caming. 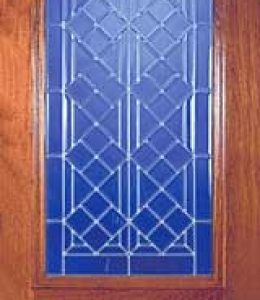 These leaded glass techniques can tie a rustic entryway design together; can make a wrought iron door feel like a timeless classical piece, and can add an interesting spin to a modern architectural design. If you are looking for a simple way to completely transform the feel of your glass panes, leaded beveled glass can certainly provide the change you are after. 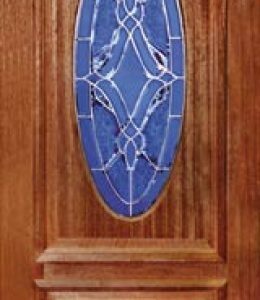 Using these unique glass techniques around your entryway allows your home to have an interesting focal point that will automatically draw people in, and increase the curb appeal of your property. Adding this special touch to the windows in your doors gives your home a distinctive and memorable style that guests are sure to notice. If you are trying to create an entryway that stands out and is extremely welcoming, investing in this artistic and creative glass is an excellent choice. With so many different options available when it comes to leaded beveled glass, choosing the right design can understandably be a difficult decision. You may be torn between classic brass and patina caming designs, or you may not know which shapes are right for your particular beveled glass pattern. Fortunately, you can visit one of our locations in Mandeville or New Orleans in order to receive professional entryway design assistance. Our team can help you navigate your choices, discuss your goals, and determine which leaded beveled glass will best suit your needs.